Transform Boundaries are places where plates slide past each other are called transform boundaries. 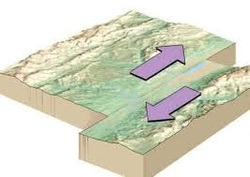 Since the plates on either side of a transform boundary are merely sliding past each other and not tearing or crunching each other, transform boundaries lack the spectacular features found at convergent and divergent boundaries. 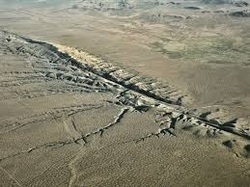 The San Andreas Fault is a transform plate boundary that divides the North American and Pacific Plates. The San Andreas fault is about 810 miles in length and is responsible for most of the Earthquakes that occur in California.